Welcome to Caribbean Soul Trekkers. We love the Caribbean islands! If you ask us to tell you the one thing we love most about the Caribbean, we wouldn’t be able to give you an honest answer. That’s because it’s not one thing – it’s EVERYTHING! Our goal is to make you fall in love with everything the Caribbean has to offer – the people, the heritage, the music, the sun, the beaches, the blue water and the rum! Here is a look back on a trip slated to be a relaxing interlude between a busy week at work and the imminent “Non stop party vibe” of Festival Rum Bahamas. Nothing beats a good playlist while limin’ on the beach! Here are few of our tunes. 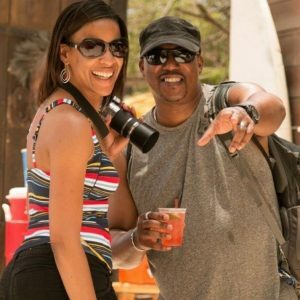 Caribbean Soul Trekkers is a travel media company based in the Washington DC metro area. Founders Mango Eddie and Naya Blue caught the Caribbean travel bug in 2009 and have been hell-bent on infecting others with Caribbean wanderlust ever since. We live by the motto “work hard, play harder”! Trek along with our team as we roam through the Caribbean meeting amazing people, delving into local culture, sampling regional delicacies, living the fete’ life and drinking the best rums. After following your treks on Facebook, you inspired my friends and I to book a trip to the St Martin Rum Festival. When I introduced myself to you at the event, I didn't know what to expect. But you quickly made us feel like one of the team and even introduced us to some of the best rum distillers in the Caribbean. What a great event and what a wonderful island! Thanks for an unforgettable experience. You guys really do get it in! Thank you again for assisting me with planning and booking my first trip to the Aruba Soul Beach Music Festival 2018. When I saw your video on YouTube I never thought I could actually do something like this. The Caribbean Soul Trekkers team welcomed me when I got to Aruba and I will never forget the great experience. I am still rockin' the Caribbean Soul Trekker t-shirt and look forward to seeing you party people in Aruba 2019! Had such a great time meeting the Caribbean Soul Trekkers while visiting Anguilla for my first time. Thank you for letting me hang out with you and showing me around the island. You guys are so much fun! Ready to trek to the Caribbean? !